Introduction Favourable pain relief results on evoking autonomous twitches at myofascial trigger points with Electrical Twitch Obtaining Intramuscular Stimulation (ETOIMS). Aim To document autonomic nervous system (ANS) dysfunction in Complex Regional Pain Syndrome (CRPS) from blood pressure (BP) and pulse/heart rate changes with ETOIMS. Methods and materials A patient with persistent pain regularly received serial ETOIMS sessions of 60, 90, 120 or ≥150 min over 24 months. Outcome measures include BP: systolic, diastolic, pulse pressure and pulse/heart rate, pre-session/immediate-post-session summed differences (SDPPP index), and pain reduction. His results were compared with that of two other patients and one normal control. Each individual represented the following maximal elicitable twitch forces (TWF) graded 1–5: maximum TWF2: control subject; maximum TWF3: CRPS patient with suspected ANS dysfunction; and maximum TWF4 and TWF5: two patients with respective slow-fatigue and fast-fatigue twitches who during ETOIMS had autonomous twitching at local and remote myotomes simultaneously from denervation supersensitivity. ETOIMS results between TWFs were compared using one-way analysis of variance test. Results The patients showed immediate significant pain reduction, BP and pulse/heart rate changes/reduction(s) except for diastolic BP in the TWF5 patient. TWF2 control subject had diastolic BP reduction with ETOIMS but not with rest. 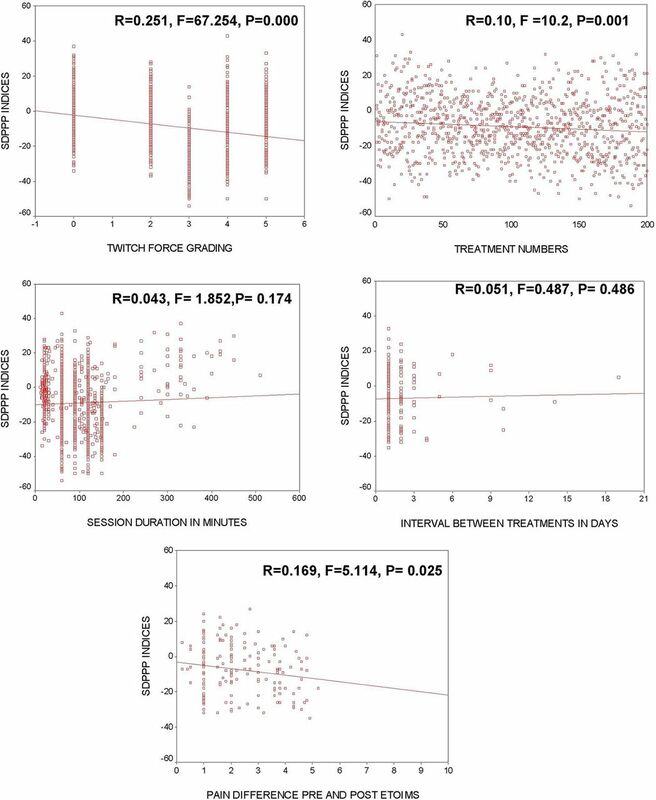 Linear regression showed TWF grade to be the most significant variable in pain reduction, more so than the number of treatments, session duration and treatment interval. TWF grade was the most important variable in significantly reducing outcome measures, especially pulse/heart rate. Unlike others, the TWF3 patient had distinctive reductions in SDPPP index. Conclusions Measuring BP and pulse/heart rate is clinically practical for alerting ANS dysfunction maintained CRPS. SDPPP index (≥26) and pulse/heart rate (≥8) reductions with almost every ETOIMS treatment, plus inability to evoke autonomous twitches due to pain-induced muscle hypertonicity, are pathognomonic of this problem. The study aimed to document the presence of ANS dysfunction in CRPS from BP and pulse/heart rate changes associated with ETOIMS. A male construction worker in his mid-40s presented for ETOIMS management of persistent pain. The persistent pain of 4 years’ duration was in the right shoulder, neck and low back, with headaches that began after being accidentally struck in the right shoulder with an object weighing ~130 kg. At various times, the pain is burning, aching, shooting, stabbing, throbbing or sharp with tingling and numbness, and he was protective of his right arm. He had no response to multiple brachial plexus nerve blocks, right rotator cuff repair, numerous pharmaceuticals (anti-inflammatories, antidepressants, anticonvulsants, pain medications), physical therapy (PT) and occupational therapy (OT). Right brachial plexus neurolysis provided significant pain relief, but the persistent pain remained at an average of 3/10, with pain exacerbations to a verbal pain score of 9/10 with any unexpected forced right arm movement or forceful contact to the right arm. Failing further improvement, at the time of presentation for ETOIMS, he had discontinued all other treatments and medications except for an anti-inflammatory medication as needed. He had never before been diagnosed as having pain due to ANS dysfunction. Physical examination revealed a maximum active range of motion (ROM) of 110° for right shoulder flexion and abduction with significant movement pain. Due to his neck and low back pain, he also showed bilateral limitation of active ROM of the cervical spine for neck rotation, straight leg raise testing (45°) and FABERE (hip flexion, abduction, and external rotation), which were limited due to low back pain resulting in muscle hypertonicity of spine, pelvic and lower limb muscles.1 2 There was significant paraspinal hypertonicity, more on the right, from neck to lower back especially in the thoracic region. Motor and sensory examinations were normal and there were no upper motor neuron changes. Diagnostic imaging consisted of (1) cervical spine MRI scan, which revealed C3–C7 degenerative disc disease, neural foraminal narrowing and congenital spinal stenosis, worse at C2–C3 and C6–C7; (2) right shoulder MRI scan, which showed supraspinatus tendinopathy/impingement; (3) right acromioclavicular joint MRI scan, which showed degenerative changes; (4) right brachial plexus, scapula and brain MRI scans, which were normal; and (5) postdecompression surgery brachial plexus ultrasound, which showed perineural scarring from proximal traction-fixation plexopathy. Although the ETOIMS treatments were routinely covered by health insurance as neuromuscular re-education PT, a lengthy waiting time was usually needed to receive pre-authorisation from workman compensation programme before treatment could begin, especially since his case was already 4 years old. The patient understood that he might not receive adequate numbers of treatment sessions to be able to reach to the stage of autonomous twitching, the goal in ETOIMS for optimal pain relief. The patient opted to self-pay $200/hour treatment sessions and his budget allowed him 3 times/week, 1 hour sessions. ETOIMS was applied using high-voltage, constant-current stimulator with the bipolar probe to stimulate the myofascial trigger points (MTrPs) motor points.1 2 The muscles consistently treated were the bilateral paraspinal muscles from C2–S1 levels, trapezius (C3, C4), latissimus dorsi (C6–C8), gluteus maximus (L5–S1) and adductor magnus (L2–S1).1 2 The dominant roots in these muscles are shown in parentheses. To be able to effectively search and adequately stimulate the MTrPs, he was treated supine, prone, right and left side-lying, sitting and in slightly flexed standing positions with every treatment. This necessitates the treating physician to move around the treatment table and have an appropriate treatment angle. The corresponding author trained the patient to self-treat without additional charges so he could perform a warm-up to reduce some of the hypertonicity prior to professional treatments.1 2 Instructions were given to prevent undesirable side effects of treatment/post-treatment pain. This included lifting the stimulation probe off the skin every two to four twitches to prevent unnecessary direct stimulation of muscle at sites where MTrPs cannot be detected especially at the reference electrode. He routinely self-measured and recorded the mean of three BP and pulse/heart rate (P) readings pre-treatment/post-treatment sitting on the same chair with steady respiration. From day 1, he self-treated for 60 min using 500 μs pulse width, 30–40 mA stimulation strength at 1.5 Hz to elicit minimum TWF2 in treated muscles. In spite of a warm-up treatment, it took the corresponding author 71 ETOIMS treatments before a few (1–3) weak force, sporadic, autonomous twitches could be elicited in the right triceps, right dorsal forearm and finger extensor muscles supplied by the C6–C7 nerve roots. The stimulation parameters were carefully adjusted according to his pain tolerance until the average parameters acceptable to him were 500 µs, 60–80 mA at 2 Hz. This was able to evoke partial TWF3 twitches at MTrPs with denervation supersensitivity (DS) in the following root(s) dominant muscles: deltoid (C6), wrist and finger extensors (C6–C7), triceps (C7), rectus femoris (L3, L4), tensor fasciae latae (L5) and hamstrings (L5, S1). TWF3 twitch elicitation was not possible in trapezius (C4) and gluteus maximus (S1) muscles even when the stimulation was increased to 1000 µs–80 mA–3 Hz combination for a few seconds in the right trapezius, where he was less pain-sensitive. The patient showed twitches suggestive of prefatigue phenomenon that did not erupt into autonomous twitches, and thus the treatment plan was intensified to reduce muscle hypertonicity to facilitate twitch elicitation. The patient self-treated on the days between the professional 3 times -per-week treatments. He was advised to add whirlpool therapy prior to ETOIMS for a possible effect on reducing muscle hypertonicity. He was adverse to taking medications such as gabapentin regularly since his preference was to control his pain daily with ETOIMS than with pharmaceutical methods. He then had a planned minor surgery, and post-surgery he was unable to receive ETOIMS for 1 week. He did not have any treatments after the surgery so the ETOIMS protocol was not disrupted. While receiving ETOIMS he undertook more numbers of treatments with longer duration sessions indicating that self-reported pain levels are reliable.1 2 He also came voluntarily for professional and self-treatments regularly, which demonstrated that he needed the treatments for daily pain relief. He made a decision to stop ETOIMS treatments after the surgery when his pain peaked to 5/10. He knew that with the increase in pain post-surgery, he would not be able to tolerate the stimulus intensities that he had been used to. Since there were no autonomous twitches even with intensive treatments, he felt he needed to seek other non-pharmaceutical treatments. Before stopping ETOIMS treatments, he had received a total of 202 sessions, and the right shoulder ROM had improved to 150° for abduction and flexion with less pain, but there was still pain aggravation to 9/10 for movements beyond that range. To fully understand TWF3 patient’s inability to progress to eliciting autonomous twitches even with intensive treatments, we compared his results with 202 consecutive data of a 64-year-old man with persistent lower back pain with TWF5 capacity,1 202 data of an 83-year-old man with TWF4 with persistent headaches2 and 202 data from the pain-free corresponding author who participated as a convenient control subject. To ascertain test results were related to ETOIMS intervention, the corresponding author also measured 202 pre/post rest-sleep values where the intervention was lying down supine (figures 1 and 2). 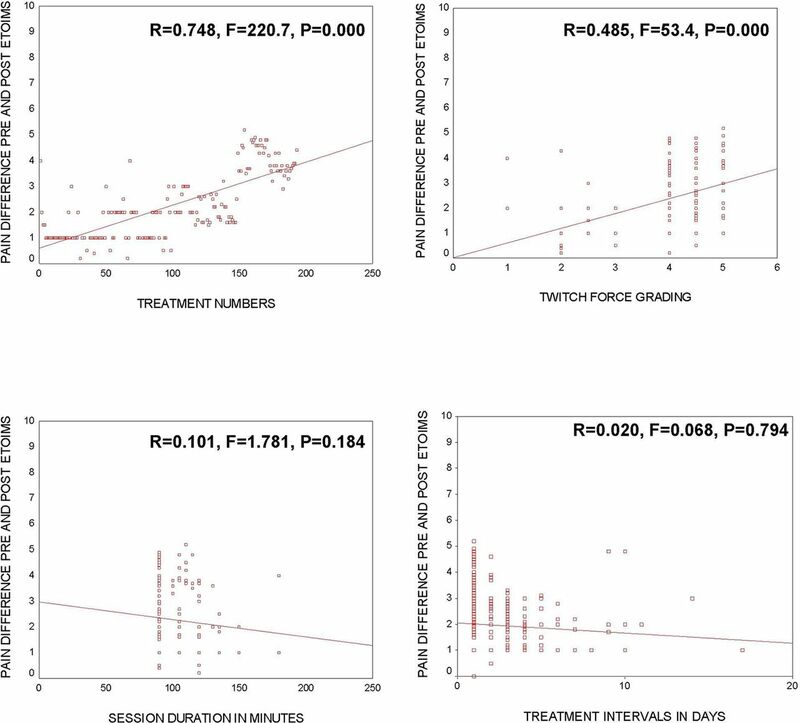 Linear regressions for treatment numbers and SDPPP indices in various twitch forces. ETOIMS (Electrical Twitch-Obtaining Intramuscular Stimulation); SDPPP indices (summed Systolic–Diastolic–PulsePressure–Pulse differences pre and post -ETOIMS). 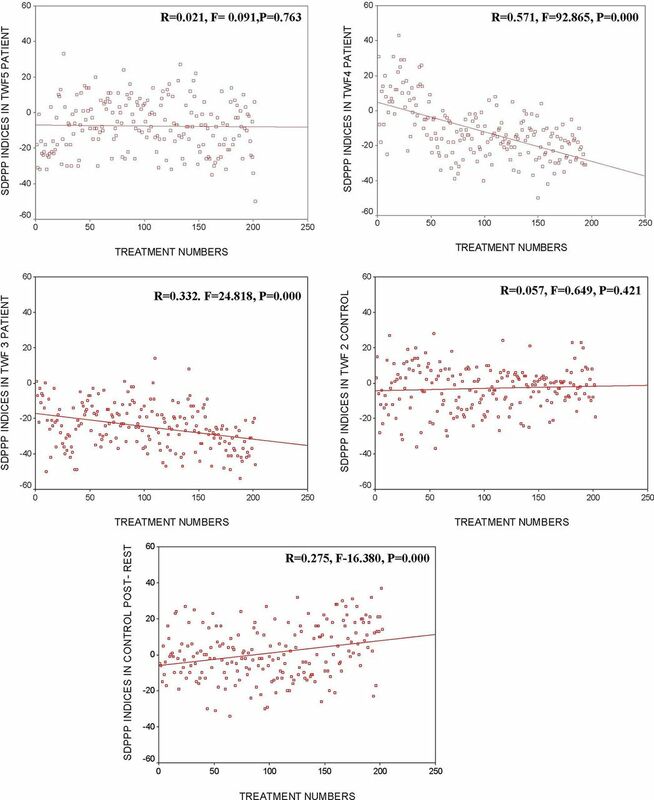 Linear regressions for pain difference (pre-ETOIMS/immediate-post-ETOIMS) and treatment numbers, twitch force grading, session duration and treatment intervals. ETOIMS (Electrical Twitch-Obtaining Intramuscular Stimulation); SDPPP indices (summed Systolic–Diastolic–PulsePressure–Pulse differences pre and post- ETOIMS). Statistical analysis was performed with SPSS V.12. Pre-ETOIMS and immediately after ETOIMS, changes in BP and pulse/heart rate of our patient with TWF3 were compared with three other individuals and analysed with one-way analysis of variance, using posthoc Bonferroni’s correction. We used this method of analysis since we needed to understand the basis of ETOIMS-related large reductions in BP and pulse/heart rate in a TWF3 patient. This patient’s results were compared with rest condition without ETOIMS-induced twitches in a normal control subject, ETOIMS-induced low force twitches in the same normal control, and patients who had the ability to elicit TWF4 and TWF5 from presence of DS. Pre-treatment/immediatepost-treatment changes in systolic blood pressure, diastolic blood pressure, pulse pressure and pulse/heart rate (P) were summed after each treatment for an index termed SDPPP (summed differences of Systolic–Diastolic–Pulse Pressure–Pulse pre and post- ETOIMS). In table 1A, there were large reductions in SDPPP index, with TWF3–5 contributed primarily by reductions in systolic BP and pulse/heart rate. Changes were most marked in TWF3. The normal control subject with TWF2 had minimal changes in SDPPP index after ETOIMS and rest. In table 1B, multiple comparisons of TWF0 results with TWF2–5 showed TWF0 with higher SDPPP index compared with TWF2 results (p<0.05) due to diastolic BP increase during rest. Comparison with TWF3 showed marked reductions in all parameters measured in TWF3. Comparison with TWF4 showed significant reduction of all parameters in TWF4 except pulse pressure. Comparisons with TWF5 showed similar reductions in TWF5 except for diastolic BP. In table 1C, multiple comparisons of parameters that relate to SDPPP index showed TWF2 had significantly higher SDPPP index compared with TWF3 from the reduction of almost all parameters with TWF3 except diastolic BP. Comparison with TW4 showed significant reductions in TWF4 for systolic BP and pulse/heart rate reductions but not diastolic BP. Comparison with TWF5 showed significant reductions in most parameters except for systolic BP in TWF5. TWF4 and TWF5 did not show differences except that TWF4 had significantly lower diastolic BP. Table 2 shows the Spearman correlations, which showed an increase in heart rate/pulse with increasing numbers of treatments for TWF0 and TWF2, but TWF2 showed a negative correlation between number of treatments and systolic and diastolic blood pressure. The TWF3 patient had to take more treatments due to increasing pain, whereas the TWF4 and TWF5 patients had pain score reduction with increasing treatment numbers. Only the TWF3 patient had no correlation of pulse/heart rate to the number of treatments. TWF4 and TWF5 patients showed a negative correlation of number of treatments to pulse/heart rate. Our patient had never been diagnosed previously with CRPS. All the diagnostic studies were primarily that of imaging studies searching for anatomical pathologies in the spine and in major nerves/plexus, whereas his persistent pain was from a combination of involvement of multiple-level spondylotic radiculopathies and autonomic neuropathy, as shown by his ETOIMS treatment results. We also highlight that reductions in BP and pulse/heart rate of such magnitude do not occur in a normal individual receiving ETOIMS. Usually, systolic BP increases significantly and proportionally to workload increase during exercise tests in healthy adults.4 We were thus able to illustrate that the pain reduction from the exercise effects of the twitches focused on the MTrPs was the main factor that decreased the sympathetic tone, shown as a reduction in BP in ETOIMS-treated individuals.1 2 Also, ETOIMS was able to increase the parasympathetic tone (see later) noted as pulse/heart rate reduction since these findings were not noted with rest/sleep. The increase in diastolic BP postsleeping has been noted in advancing age in women.5 We propose that the mild increase in diastolic BP after sleeping is probably related to inactivity and lack of movement/muscle contractions during sleep, and not due to increased sympathetic tone since the more vigorous exercise effects of TWF3–5 consistently lowered systolic pressure. CRPS can develop after an initiating noxious event or immobilisation.6 Characteristics of CRPS-I include continuing pain, allodynia and hyperalgesia disproportionate to the inciting event. Oedema, changes in skin blood flow or abnormal sudomotor activity in the painful region may occur. CRPS-II has similar symptoms that develop after a nerve injury not necessarily limited to the distribution of the injured nerve.6 Temperature changes, swelling, reduced joint ROM, weakness, tremor/dystonia, skin atrophy or altered hair/nail growth, localised osteoporosis7 and alterations in body perception8 can occur. Sympathetic dysfunction in extremities of patients distal to site of trauma consists of hypersensitivity to catecholamines as a result of autonomic denervation, whereas SNS impulses may be increased proximal to the site of trauma.28 Persistent CRPS-I is a post-traumatic neuralgia associated with distal degeneration of small-diameter peripheral axons. The most frequent symptoms of autonomic involvement and small-fibre abnormalities include spontaneous pain, dysesthesias, allodynia, sudomotor dysfunction (anhidrosis) and orthostatic hypotension, and our patient with CRPS with maximum TWF3 has all these features. Like in CRPS, chronic pain magnitude in fibromyalgia is directly related to small-fibre sympathetic drive to the heart and great vessels. Substance P in the blood stimulates the release of interleukin (IL)-8, which promotes sympathetic pain, and IL-6, which induces hyperalgesia, fatigue and depression common in fibromyalgia.29 Our patient did not have such blood studies but has clinical evidence of small-fibre sympathetic drive that occurs with fibromyalgia. As in humans with fibromyalgia, chronic widespread pain in rats shifts the cardiac sympathovagal balance towards sympathetic predominance and decreases spontaneous baroreflex sensitivity.30 ETOIMS was able to reduce pain by restoring the cardiac sympathovagal balance. It has the capacity to reduce sympathetic tone evidenced by reduction in BP and increasing parasympathetic tone evidenced by reduction in pulse/heart rate. Experimental activation of carotid baroreceptors triggers marked antinociceptive effects.31 There is an inverse relationship between lower cardiac baroreflex functioning and higher levels of clinical pain.32 Pathways that modulate pain such as nucleus tractus solitarii (NTS) receive baroreceptor input from the glossopharyngeal and vagus nerves and projection from neurons in the spinal laminae involved in nociceptive processing. Periaqueductal grey, nucleus raphe magnus and rostral ventrolateral medulla receive direct or indirect inputs from NTS. In persistent pain, baroreceptor afferents may alter nociceptive processing and subjective pain experience through modulation of the activity of above structures.33 There is clinical evidence that ETOIMS effects may result from the influence on carotid baroreceptors when treatments are performed on neck muscles as well as sternocleidomastoid muscles. Important factors for pain reduction were TWFs and number of treatments (figure 1), with TWF being more significant than the number of treatments for reducing the SDPPP index (figure 2). ETOIMS thus reduces sympathetic tone and increases parasympathetic vagal tone. Vagus nerve stimulation can occur due to DS on treating trapezius and sternocleidomastoid muscles supplied by the accessory nerve whose cranial portion is part of the vagus nerve. This, in turn, increased baroreceptor sensitivity to alleviate pain36 37 with decreased pulse/heart rate,1 2 as noted in patients with TWF4 and TWF5. However, lack of correlation of treatments over time to pulse/heart rate in the TWF3 patient indicates poor vagal tone, although ETOIMS reduced sympathetic tone in the TWF3 patient similar to other individuals. The increase in heart rate in the control subject is compensatory to a reduction in BP with increasing number of treatments. Rest reduces vagal tone (table 2), confirming that pulse/heart rate reduction with ETOIMS is through vagal stimulation. Also, the presence of significant hypertonicity of muscles supplied by accessory nerve may add to inhibit vagal nerve stimulation in the TWF3 patient. This is the most critical reason since the vagus nerve inhibits sympathetic activity and modulates inflammation, oxidative stress, brain activity and opioid receptors.38 Similarly, hypertonicity in other muscles prevented electrical spread from reaching MTrPs, with DS needed for local and remote autonomous twitch elicitation. He thus had to take more treatments without progressive pain relief as with the TWF4 and TWF5 patients. The similar BP (except for diastolic BP) and pulse/heart rate in patients with TWF4 and TWF5 indicated that the most significant factor that was responsible for slow fatigue was more muscle hypertonicity in TWF4 than in TWF5 patient. Mixed peripheral nerves contain motor, sensory and small-fibre postganglionic sympathetic axons and small somatic fibres (thinly myelinated (A-delta) or unmyelinated (C-fibre)). The ratio of unmyelinated to myelinated fibre density in mixed peripheral nerves is 3.7:1.39 A-delta or unmyelinated C-fibre detect and transmit information triggered by mechanical, thermal and chemical stimuli. Critical vasomotor and trophic efferent functions may contribute to CRPS, through the antidromic release of calcitonin gene-related peptide and substance P.19 Small-fibre degeneration and pain often precede degeneration of myelinated fibres in sensorimotor polyneuropathies.40 After traumatic injury to rat sciatic nerve, the cell bodies of small-diameter axons in the dorsal root ganglion and their central axons degenerate preferentially.41 This explains how trauma can cause small-fibre predominant axonal degeneration, dysfunction and CRPS without apparent large-fibre injury. Mechanisms of CRPS in animal models include ephaptic transmission, adrenergic receptors on sensory neurons, the indirect coupling of sympathetic and sensory neurons, sensitisation of nociceptive afferents, and sensitisation of dorsal horn neurons from the CNS.42 Postganglionic muscle sympathetic nerve activity recordings show underlying excessive sympathetic activity. Body nociceptors may develop catecholamine sensitivity, enabling norepinephrine released by sympathetic nerve fibres to activate/sensitise afferent neurons, eventually resulting in increased nociceptive firing and CNS sensitisation, which play a crucial role in generating and sustaining chronic pain.38 An inverse relationship exists between lower cardiac baroreflex functioning and higher levels of clinical pain. The higher the sympathetic drive to the heart and vessels, the higher the magnitude of chronic pain,43 as exemplified in our patient. In addition to sympathetic dysfunction, nociceptive C and A-delta somatosensory axons also innervate blood vessels. Their degeneration or neuroeffector secretions can produce signs of neurogenic inflammation.19 Some dermal vessels entirely lack sympathetic innervation,39 so peripheral microvascular dysregulation does not always implicate sympathetic involvement or dysautonomia. Increased heart rate and decreased heart rate variability at rest in patients with CRPS suggest a general autonomic imbalance with sustained stress response.44 SDPPP index changes in the TWF3 patient, which differs significantly from other subjects and is compatible with general autonomic imbalance (figure 3). Linear regressions for SDPPP indices and twitch force grading, treatment numbers, session duration and treatment intervals. SDPPP, systolic–diastolic–pulse pressure–pulse; TWF, twitch force. As with other neural injuries, conditions that destroy some small fibres, or tissue changes triggered by partial axonal loss (eg, upregulation of growth factors), can cause neighbouring survivors to malfunction. Surviving small fibres with reduced thresholds for ectopic firing45 have been termed angry or irritable nociceptors.46 47 Damage to peripheral axons of primary afferents usually affects their central axon and triggers diffuse glial activation and abnormalities of postsynaptic neurons in the dorsal horn and higher centres.48 This typifies neuropathic pain as a systems disorder, with abnormal firing of central pain neurons from reduced activity of inhibitory interneurons in the dorsal horn. These studies were found to provide short-term relief of CRPS pain on systematic review of treatments compared with placebos,49 and they include the following: (1) ketamine (N-methyl-d-aspartate receptor antagonist), bisphosphonates (used in osteoporosis) and calcitonin (calcium-lowering hormone), and intravenous pamidronate; (2) graded motor-imagery programmes may reduce pain and improve function for 3–6 months, compared with conventional physiotherapy/exercises (PT); (3) mirror therapy may reduce pain and improve function more than controlled sham condition in poststroke CRPS; (4) PT or OT versus social work passive attention control is associated with small positive effects at 1-year follow-up; (5) oral corticosteroids; (6) epidural clonidine (centrally acting α2 adrenergic agonist), intravenous regional block (IVRB) ketanserin (5-HT2 receptor antagonist) and IVRB bretylium (blocks release of norepinephrine from nerve terminals); (7) sympathetic blockade with botulinum toxin A may deliver a longer duration pain relief than local anaesthetic sympathetic blockade; and (8) topical dimethyl sulfoxide (DMSO) improves patients’ self-ratings of improvement and achieves greater improvements in composite CRPS scores50 than IVRB with guanethidine. CRPS scores are standardised, common methodology for making decisions as to whether unidentified pain conditions represent CRPS or not. Significant improvements had been made in terms of quantification and significant objectification of the diagnostic data.50 However, ETOIMS treatment-related SDPPP indices reduction by ≥26 and pulse/heart rate reduction by ≥8/min consistently with almost every treatment are objective. The use of SDPPP is practical and is useful for the clinician in the real-time diagnosis, treatment, prognosis and follow-up of CRPS. Not found to be more effective than placebo49 are (1) topical DMSO; (2) intravenous mannitol; (3) gabapentin (antiepileptic medication); gabapentin at doses of 1200 mg or more was effective for some patients with some painful neuropathic pain conditions, with 35% experiencing pain relief compared with 21% for placebo; (4) sarpogrelate hydrochloride (selective 5-HT2 antagonist), intravenous lidocaine (local anaesthetic) or tadalafil (phosphodiesterase isozymes inhibitor and vasodilator), IVRB atropine (anticholinergic), and IVRB droperidol (antidopaminergic drug); and (5) repetitive transcranial magnetic stimulation, ultrasound, pulsed electromagnetic field, relaxation therapy and manual lymphatic drainage. Found effective in improving pain are (1) spinal cord stimulation plus PT, as opposed to PT alone; (2) PT and OT, as opposed to passive attention social work control for 6 months; PT but not OT improves impairment for 4 months compared with the same control; (3) Qigong therapy compared with sham Qigong therapy; and (4) acupuncture, which offers short-term improvement in pain not superior to sham when added to rehabilitation compared with rehabilitation alone in poststroke CRPS. Electroacupuncture plus rehabilitation therapies might be more effective than lidocaine, triamcinolone acetonide and vitamin B12. There is no evidence from controlled trials on the efficacy of surgical sympathectomy. Surgical decompression may provide the most effective pain relief for lesions that are clearly localised in patients where nerve exploration is appropriate. Ablative (nerve cutting or neurodestructive) procedures are not indicated.15 Local anaesthetic sympathetic blockade is not effective. Unlike ETOIMS, the limitation of most of these treatments is that they cannot be safely and efficaciously used over prolonged periods of time nor can their effects be quantified objectively in the long-term management of persistent pain due to CRPS. Evaluation of small fibres with diameter <6 μm, higher depolarisation threshold and slower conduction velocity usually need tests to guide adequate therapy and optimise follow-up. Tests include cardiovascular monitoring, sudomotor testing, pupillary responses, quantitative sensory tests, thermography and laser evoked potentials. To record C-fibre activity, invasive, complex, costly, time-consuming, high interindividually variable micrographic techniques are available but mostly for experimental studies. To manage CRPS, it is essential for clinicians to have access to simple, objective, reproducible and cost-effective systems such as ETOIMS. The heart is constantly controlled by sympathetic and parasympathetic divisions of the ANS. Blood vessels are controlled predominantly by the SNS to maintain appropriate BP and organ blood flow over widely varying conditions. This can be adversely affected by pathological conditions that can damage one or both branches of the ANS.51 52 The pain and hypertension relationship involves ascending acute nociception, which recruits segmental spinal reflexes causing activation of the SNS. As with the TWF3 patient, this increases peripheral resistances, heart rate and stroke volume. The response also involves the hypothalamic–pituitary–adrenal axis, with further activation of the SNS by the adrenal glands. Serial vital signs assessments recorded for analysis with statistical process control method can detect subtle changes that are not due to chance, thus obviating the need for randomised controlled studies. Suspected CRPS with ANS dysfunction can be detected within a few ETOIMS sessions (figures 1–3 and tables 1–2) if SDPPP indices reduce by ≥26 and pulse/heart rate reduces by ≥8/min consistently with almost every treatment. Pulse/heart rate is the most significant contributor to the SDPPP index (table 1A). Since TWF is most important in the reduction of pain, BP and pulse/heart rate, the inability to evoke local and remote autonomous large force twitches due to muscle hypertonicity of ANS dysfunction maintains the severe persistent pain. Rat experiments showed that muscle activity reduces DS.53 For effective pain relief, local and remote large force autonomous twitches are essential also for reduction in sympathetic tone with an increase in parasympathetic vagal tone. ETOIMS is highly suitable for pain relief and useful in real-time clinical diagnosis and prognosis in persistent pain associated with autonomic dysfunction in CRPS. The inability to evoke autonomous twitches plus the ability of ETOIMS to favourably affect BP and heart rate remarkably are pathognomonic of CRPS. These are useful armamentarium that can distinguish the presence of autonomic involvement in CRPS for further management decisions.
. Migraine and persistent pain from sports/cumulative trauma are helped with ETOIMS. BMJ Innovations 2017;3:104–14.
. Electroventilation-a missed opportunity? Biomedical instrumentation & technology 1998;4:401–14.
. Classification of chronic pain: descriptions of chronic pain syndromes and definitions of pain terms. 2nd ed. Seattle, WA: IASP Press, 1994. IASP Diagnostic Criteria for CRPS-I (Reflex Sympathetic Dystrophy).
. Relationship between sympathetic activity and pain intensity in fibromyalgia. Clin Exp Rheumatol 2015;33:S53–S57.
. Nerve and muscle anatomy and physiology. In: King JC , Robinson LR , Spielholz NI , eds. Electrodiagnostic medicine. 1st ed. Philadelphia: Henley & Belfus Inc, 1995.
. The normal sural nerve in man. I. ultrastructure and numbers of fibres and cells. Acta Neuropathol 1969;13:197–216.
. Sural nerve morphometry in diabetic autonomic and painful sensory neuropathy. A clinicopathological study. Brain 1991;114:867–92.
. Relationship between sympathetic activity and pain intensity in fibromyalgia. Clin Exp Rheumatol 2015;33:S53–7.
. Control of the cutaneous vascular system by afferent neurons. In: Morris JL , Gibbins IL , eds. Autonomic Innervation of the Skin. Amsterdam, Holland: Harwood Academic Publishers, 1997:213–67.
. Early onset of spontaneous activity in uninjured C-fiber nociceptors after injury to neighboring nerve fibers. J Neurosci 2001;21:RC140.
. Interventions for treating pain and disability in adults with complex regional pain syndrome- an overview of systematic reviews. Cochrane Database of Systematic Reviews 2013:4. John Wiley & Sons, Ltd.
. Mechanisms of heart rate and arterial blood pressure control: implications for the pathophysiology of neurocardiogenic syncope pacing & clinical electrophysiology. 1997;20:764–74. Contributors JC was responsible for planning, conducting and reporting of the work described in the submitted article. For the neurophysiology section input/feedback: FB. For the statistics section input/ feedback: DVN. Data sharing statement We have submitted all data relating to this manuscript to BMJ Innovations. All previous data have been published in BMJ and these are the links: http://casereports.bmj.com/cgi/content/full/bcr-2015-211816?ijkey=TFlyCCTz1g85rzB&keytype=ref and http://innovations.bmj.com/cgi/content/abstract/bmjinnov-2016-000151.